Business leaders analyze opportunities for growth and expansion using a cross-section of stringent criteria – most of which are rooted in economic, resource and operational factors. Consider then a scenario in which a group of countries on a single continent boast some of the world’s fastest-growing economies.1 In this same place, mobile phone and Internet usage are growing faster than any other region. The total market is an estimated $900 billion opportunity placing the region as the 10th largest economy in the world. These basic details beg anyone in business to take a closer look. And, it may surprise some that the continent that boasts this opportunity is Africa. Long overshadowed by reports of regional strife and images of suffering, Africa is poised for explosive growth and development. According to World Bank data, if Africa were a single country, its total gross national income (GNI) in 2006 would rank ahead of Russia and Brazil among others. Africa is richer than India on the basis of GNI, and a dozen African countries have a higher GNI per capita than China. While barriers to entry are high, companies that develop strong distribution networks and acquire deep understanding of market forces can generate high margins. For companies that have evaluated market opportunity and are able to talk to African consumer bases, many are enjoying remarkable growth rates ranging from 30 to 60 percent year on year. Globalization provides firms with tremendous opportunities along with challenges. 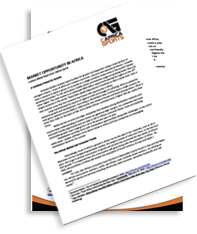 In this micro-white paper, readers will learn more about trends in Africa and how companies are leveraging marketplace dynamics for success. Interestingly, much of Africa’s growth is driven not by the sale of raw materials, such as oil or diamonds, but by a burgeoning domestic market, the largest outside of India and China. In the last four years, the surge in private consumption of goods and services has accounted for two thirds of Africa’s GDP growth.2 It is expected that this consumption will grow along with the population of Africa. By 2030, the population of Africa will exceed the population of North America, Europe and Japan –combined. “The new Africa story is consumption,” says Graham Thomas, head of principal investment at Standard Bank Group, which operates in 17 African countries. For any global firm interested in growth, Africa should be considered an essential part of its portfolio. Foreign multinational companies such as Nestle and Swissport International report some of their highest growth in Africa. London-based Unilever has conducted business in Africa selling food, soaps-suds, personal-care products and more for more than a century. From the 1920s through the early 1990s, Unilever dominated trade but wasn’t focused on a specific product line. In fact, Unilever’s West Africa Company would sell anything from washing powder to trucks. Today, the company is much more focused and defines its market as sub-Saharan, an area of 657 million people, and sells into 48 countries. The company is tops in laundry, skin and oral care, deodorants, spreads and cooking products and captures 67 percent of every dollar spent by consumers. Now, the company is using this success as a springboard to its “Path to Growth” strategy that Unilever has set for all its operations. Still, many Africans live on less than $1 per day, so Unilever has developed a strategy to compete for the thin wallet. First, it uses the “small unit packs/low unit price” concept. For example, Uniliver packages its Omo washing powder or Blue Band margarine in small sachets and sells them for less than the equivalent of 10 cents (US) a packet. Unilever also attributes much of its continental success due to its ability to efficiently manage its packaging and distribution costs where much of the population is dispersed throughout the region. A strong foundation is in place. For the right companies willing to understand market dynamics and appreciate the nuances of African consumers, investment in sub-Saharan Africa can provide tremendous bottom-line growth and bright business prospects.